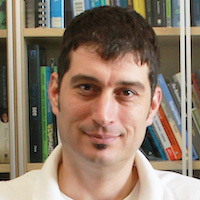 Peter Scupelli is an Associate Professor in Interaction Design, Chair of the Environments track, and Director of the Learning Environments Lab. Peter’s current research focus is on learning environments. He teaches both undergraduate and graduate level courses. Peter’s training and career path link architecture, interaction design, and human-computer interaction research. Human-Computer Interaction Institute, Carnegie Mellon University | Pittsburgh, PA.
School of Design, Carnegie Mellon University | Pittsburgh, PA.
School of Architecture, University of Genoa | Genoa, Italy. • Thesis title Stranieri tra i residui della citta’ contemporanea: Un percorso di ricerca attraverso Land Art, Terrain Vague, ed Unheimliche. [Strangers in the residual spaces of the contemporary city: an inquiry through Land Art, Terrain Vague, and the Uncanny.] Committee Stefano Boeri (chair), Anna Costantini (art critic), Fabrizio Paone (urban planner), & Brunetto DeBattè (architecture researcher). Center for Health Design | Concord, CA. • Evidence-based design is an emerging design area in healthcare architecture that links design decisions to the best available research; I apply similar methods for interaction design and design studio environments. Inventado, P.S. & Scupelli, P., (2017) Feedback Design Patterns for Math Online Learning Systems. 2017 Conference Proceedings of the European Pattern Languages of Programs. (Euro-PLoP 2017) ACM, New York. Inventado, P.S. & Scupelli, P. (2017 ). Using Contextual Leaning-Environment Features to Identify Design Pattern Appropriateness In Proceedings of the 12th Viking Conference on Pattern Languages of Programs (VikingPLoP 2017). ACM, New York. Inventado, P., Scupelli, P., Ostrow, K. Heffernan, N. , Almeda, V., & Slater, (2017) Contextual Factors Affecting Hint Utility, STEM journal. Inventado, P.S. & Scupelli, P. (2016). Design Patterns for Math Problems and Feedback in Online Learning Systems. In Proceedings of the 11th Viking Conference on Pattern Languages of Programs (VikingPLoP 2016). ACM, New York, NY, USA. Slater, S., Ocumpaugh, J., Baker, R., Scupelli, P., Inventado, P.S., and Heffernan, N. (2016) Semantic Features of Math Problems: Relationships to Student Learning and Engagement The 9th International Conference on Educational Data Mining EDM 2016 Raleigh, North Carolina, USA, June 29, 2016 – July 2, 2016. Inventado, P.S., Scupelli, P., Van Inwegen, E., Ostrow, K. Heffernan, N. , Baker, R., Slater, S., and Ocumpaugh, J. (2016) Hint availability slows completion times in summer work. The 9th International Conference on Educational Data Mining EDM 2016 Raleigh, North Carolina, USA, June 29, 2016 – July 2, 2016. Inventado, P.S. & Scupelli, P. (2015) Towards an open, collaborative repository for online learning system design patterns. eLearning Papers, 42(Design Patterns for Open Online Teaching), 14-27. Inventado, P.S. & Scupelli, P. (2015) Data Driven Design Pattern Development to Improve Online Learning Systems. 2015 Conference Proceedings of the European Pattern Languages of Programs. (Euro-PLoP 2015) ACM, New York. Inventado, P.S. & Scupelli, P. (2015). A Data-driven Methodology for Producing Online Learning System Design Patterns. In Proceedings of the 22nd Conference on Pattern Languages of Programs (PLoP 2015). ACM, New York. Scupelli, P., & Hanington, B. (2016) Design Studio Desk and Shared Place Attachments: A Study on Ownership, Personalization, and Agency. 2016 Conference of the Design Research Society (DRS2016), 27-30 June, Brighton, United Kingdom. Yun, R., Aziz, A., Scupelli, P., Lasternas, B., Zhang, C., & Loftness, V. (2015). Beyond Eco-Feedback: Adding Online Manual and Automated Controls to Promote Workplace Sustainability. In Proceedings of the 33rd Annual ACM Conference on Human Factors in Computing Systems (pp. 1989–1992). Yun, R., Aziz, A., Lasternas, B., Zhang, C., Loftness, V., Scupelli, P., Mo, Y., Zhao, J., & Wilberforce, N. (2014) The design and evaluation of intelligent energy dashboard for sustainability in the workplace. Proceedings of the HCI International Conference. Yun, R., Lasternas, B., Aziz, A., Loftness, V., Scupelli, P., Rowe, A., Kothari, R., Marion, F., & Zhao, J. (2013) Toward the Design of a Dashboard to Promote Environmentally Sustainable Behavior among Office Workers. Proceedings of the Persuasive Technology Conference 2013. Yun, R., Scupelli, P., Aziz, A., & Loftness, V., (2013) Sustainability in the workplace: Nine intervention techniques for behavior change. Proceedings of the Persuasive Technology Conference 2013. Hughes, K., Scupelli, P., Fidler, S., & McGaffey, A. (2010) Think, Make, Evaluate, (Evolve): Designing participatory tools to better understand how to help physicians communicate with families about obesity. A case study in sustainable co-design. Challenges and Opportunities for Design Research, Education and Practice in the XXI Century. LeNS Conference, Bangalore, 29th September to 1st October 2010. Scupelli, P. & Hughes, K., (2011). Socio-Ecological Service Design: Integrated services for indivuduals, families, organizations, and communities. Service Design Global Conference. San Francisco, CA, USA, October 20-21, 2011. Scupelli, P. (2011) Get Fit with the Fitwits: A Six-Week Community Game Evaluated.Heinz Endowments evaluation report. Scupelli, P. (2011) I AM Fitwits: an evaluation of a school-based obesity prevention game. Heinz Endowments evaluation report. Hughes, K., & Scupelli, P., (2011) Emerge, disseminate, evolve: Three phases to sustainable co-design. Scupelli, P. & Hughes, K. (2010) Get Fit with the Fitwits: Co-design linked to increased participation in health literacy game. Scupelli, P., Fussell, S. R., & Kiesler, S., (2010) Architecture and Information Technology as Factors in Surgical Suite Information Sharing and Coordination. Proceedings of the 1st ACM International Health Informatics Symposium. Scupelli, P., Xiao, Y., Fussell, S.R., Kiesler, S., & Gross, M.D., (2010). Supporting Coordination in Surgical Suites: Physical Aspects of Common Information Spaces. CHI 2010, Proceedings of the 28th International Conference on Human Factors in Computing Systems. NY: ACM Press. (pp. 1777-1787). Scupelli, P., Kiesler, S., & Fussell, S. R., (2007). Using isovist views to study placement of large displays in natural settings. CHI ‘07 Extended Abstracts on Human Factors in Computing Systems (pp. 2645-2650). NY: ACM Press. Ren, Y., Kiesler, S., Fussell, S.R., & Scupelli, P. (2007). Supporting large-scale collaboration in critical environments. Proceedings of the [40th] Annual Hawaii International Conference on System Sciences, Computer Society Press. Scupelli, P., Fussell, S. R. & Kiesler, S. (2007). Juggling work among multiple projects and partners. Proceedings of the [40th] Annual Hawaii International Conference on System Sciences, Computer Society Press. Scupelli, P., Kiesler, S., Fussell, S. R., & Chen, C. (2005). Project View IM: A tool for juggling multiple projects and teams. CHI ‘05 Extended Abstracts on Human Factors in Computing Systems (pp. 1773-1776). NY: ACM Press. Fussell, S. R., Kiesler, S., Setlock, L. D., Scupelli, P., & Weisband, S. (2004). Effects of instant messaging on the management of multiple projects. Proceedings of CHI 2004 (pp. 191-198). NY: ACM Press. Tan, D.S., Gergle, D., Scupelli, P.,& Pausch, R. (2006). Physically large displays improved performance on spatial tasks. ACM Transactions on Computer-Human Interaction, 13(1), 71-99. Tan, D.S., Gergle, D., Scupelli, P., Pausch, R. (2004). Physically large displays improve path integration in 3D virtual navigation tasks. Proceedings of CHI 2004 (pp. 439-446).NY: ACM Press. Tan, D.S., Gergle, D., Scupelli, P., & Pausch, R. (2003). With similar visual angles, larger displays improve performance on spatial tasks. Proceedings of CHI 2003 (pp. 217-224).NY: ACM Press. architecture and landscape] (pp. 90-95). Scupelli, P. (1999, May). Stranieri tra i residui della città contemporanea [Strangers among the residuals of the contemporary city]. Gomorra, 2, 96-98. Scupelli, P. (1998, November/December). Esplorazioni attorno a Genova [Explorations around Genoa]. in Giuseppe. Bimestrale di Architettura, 3(6), 10. Boeri, S. (2000, June). Tre posti caldi: A12, Cliostraat, Stalker [Three hot spots: A12, Cliostraat, Stalker]. in Abitare, 396, 150-163. Molinari, L. (1999, September/October). Sguardo nomade [Wandering eyes]. inOttagono: Design and Designers, 134, 46-51. Salvadeo, P. (ed.). (1997). Paesaggi di architettura: Infrastrutture, territorio, e progetto [The landscape of architecture: Infrastructure, territory and design]. Milan: Skira. Secchi, B. (ed.). (1996). Un progetto per Prato: Il nuovo piano regolatore [A project for Prato: The new urban plan]. Florence, Italy: Alinea. Cadorna – Bovisa. (1995). Milan: La Triennale di Milano & Electa. De Carlo, G. (1995). Reading and Design of the Territory 1. San Marino, International Laboratory of Architecture and Urban Design. Milan: I.L.A.U.D. Environments. 2016 IXDA Educators Conference. Helsinki, Finland. February 28-29. Scupelli, P. (2012). Four Evidence-Based Design Guidedlines for Coordination in Surgical Suites. 10th Annual Medical Humanities Consortium Conference. Under Construction: Hospitals, Healthcare, and the Medical Humanities. Pittsburgh, PA, USA, May 21, 2012. Scupelli, P. & Hughes, K., (2011). Socio-Ecological Service Design: Integrated services for individuals, families, organizations, and communities. Service Design Global Conference. San Francisco, CA, USA, October 20-21, 2011. Scupelli, P. (2011). Assessing Practical Impact of Surgical Suite Research. iConference 2011, Seattle, WA, USA, February 8-11, 2011. Scupelli, P. (2019). Teaching to Future – Tradeoffs Between Flipped Classroom and Design Course Pedagogies. Georgia Tech, School of Interactive Computing. College of Computing. March 13, 2019. Scupelli, P. (2018). What are some boundaries for design education? Design 3.0 International Forum. Academy of Arts & Design, Tsinghua University. Beijing, China, October 21, 2018. Scupelli, P. (2018). Olympics as Desirable Futures. China National Arts Fund- Training Innovative Art and Tech Talents for the Winter Olympic Games. Academy of Arts & Design, Tsinghua University. Beijing, China, June 9, 2018. Scupelli, P. (2018). Transitioning Design to align short-term and long term design US2020 STEM Collaboratory workshop. Pittsburgh, PA, February 1, 2018. Scupelli, P. (2017). Teaching to transition design. Glasgow School of Art (GSA). Winter School 2017. Forres, Scotland. January 25, 2017. Scupelli, P. (2016). Dexign Futures: align short-term and long-term design. AR2U Alliance for the Arts in Research Universities University of Colorado, Denver, Colorado. November 4, 2016. Scupelli, P. (2016). Improving Online Learning Experiences with Big Data, Design Patterns, Randomized Control Trials, and Online Repositories. HAN University of Applied Sciences. Arnhem, Netherlands, April 16, 2016. Scupelli, P. (2016). Post-HCI worlds: Exploring design spaces with environments, values, narratives, and time horizons. Virginia Tech University. Blacksburg, VA. March 18, 2016. Scupelli, P. (2014). Collaborative spaces and individual workspaces in design studios: a study on ownership, personalization, agency, emotion, and pleasure. Indiana University. Bloomington, IN, October 24, 2014. Scupelli, P. (2014). An Inquiry Into Design Studio Story Making. NTNU, [Norwegian University of Science and Technology] Trondheim, Norway, March 11, 2014. Scupelli, P. (2011). Behavior Change Through Interaction Design. Maya Design. Pittsburgh, PA, April 14, 2011. Scupelli, P. (2011). Design in the context of complex problems. Division of Design, School of Art, University of Washington, Seattle, WA, March 7, 2011. Scupelli, P. (2010). Supporting coordination in surgical suites with architecture, information artifacts, and people’s behavior. Grand rounds Allegheny General Hospital, Pittsburgh, PA, January 27, 2010. Scupelli, P. (2009). Using architecture, artifacts, and people’s behavior to support coordination. Industrial Design Institute Science and Technology, Daejeon, Republic of Korea, October 8, 2009. Scupelli, P. (2007). Does the location of surgical suite schedule whiteboards matter? Scupelli, P. (2005). Juggling multiple tasks and partners. In-Group Graduate Research Symposium, Tepper School of Business, Carnegie Mellon University, September 16, 2005. Scupelli, P. (2004). Project View Instant Messenger: Managing multiple tasks and partners online. HCII Graduate Research Presentations. Human-Computer Interaction Institute, Carnegie Mellon University, August 21, 2004.